As I stand at the Shalan Ni Kabadjo camping ground sandwiched between the Filling Station Fast Food and Restaurant; and the Camp John Hay Trade and Cultural Center, the venue of The North Face 100 2013 held April 20-21, 2013, I saw runners with their camping gears arriving from the bus terminal and slowly filling the place up along with the event officials and staffs going about setting up booths. That moment I felt shivers in me and other indescribable feeling creeping upon me. This was my first time to join this event. The North Face 100 Philippines Baguio-Benguet leg is considered one of the most difficult route among the different TNF 100 route across the world. I noticed though, that there was not a huge wall map displaying the race route for the 11 km and 22 km category. Apart from the fact that, the 22km and 11km finishers will not be given finisher medal, finisher shirt and loot bag, I thought the lack of directional map further reinforced the idea in me that the latter categories was just a sideshow for the main event, which featured the 100km and 50 km. I arrived two days before the 22 km scheduled run thinking that there will also be a briefing before the race as instructed those running in the 100 km and 50 km categories. But when I approached the event’s secretariat I was told that this was not the case. However, my coming to Baguio two days earlier proved to be a boon. I expected a huge throve of runners from Manila will be trooping to Baguio to join the event. Bus slots and hotel accommodations would be at stake. I also learn that the accommodation I booked for myself located near Wright Park and the Camp John Hay near Paterno Drive entrance, thinking it was closer to the event’s venue turned out was actually further away, for the event was located at the other end of Camp John Hay near Ayala Techno Hub where the CJH main entrance is located which is about P60.00 per taxi fare from my hotel or about 15 to 20 minutes walk. So, the whole time I was in Baguio I was walking to and from the event’s venue hoping that the additional mileage would help me acclimate to the condition of the place. At the huge wall map for the 100 km and 50 km run categories, I was trying to figure out where might be the race route for the 22 km runners. In both the 100 km and 50 km routes there were portion of it that I previously had already experienced running at in Renderfarm’s Baguio 21K series like the stretch of Loakan Road, a steep portion of the Happy Hallow, route to PMA and uphill run to Sto. Tomas. This led me to think that maybe the race route for the 22 km wouldn’t be much different from the aforementioned race route I had before. This means easier route and suspiciously designed to entice runners to upgrade the following year to 50 km. I left the event’s venue feeling relieved that this run would be a cinch. The following day April 20 at around 3:00 p.m. lured by my curiosity I returned to the event’s venue to see how the 50 km runners whom I expected were already heading back to the finish arch were faring. By the time I got there, around 43 male finisher runners had already crossed the finish line while about 11 for their female counterpart. Those finishers I managed to see returning had been running for roughly 10 hours. I noticed that those who were crossing the finish arch were not showing signs of fatigue or distress except for a couple of runners who were walking their way to cross the finish line. An acquaintance of mine expressed confidence that the 50 km seems like manageable and kid me to go for it next year. As the runners one by one arrived, marshals waiting for them blew their whistles to have the event secretariats and host at the other end of the finish line alerted and prepared to receive the runners with their spiel, finisher medals and photo opt. For their part the bystanders even though not part of some of the approaching runner’s entourage where cheering and clapping for the runner thereby adding further drama to finishing the race. I felt elated for these runners and imagined myself doing the same thing next year. The following morning about 3:00 a.m., I arrived at the race venue for at 5:30 a.m. it would be our turn to run. A runner from the 100 km category suddenly appeared and crossed the finished line. Then in a couple more minutes a PUV Jeep loaded with injured 100 km runners and those who opted not to finish the race anymore arrived and alighted. Some runners limped their way to the secretariat booth. Then other runners from the 100 km began arriving one by one. Since it was quite early in the morning the marshals waiting for runners were not that quite alerted to blow their whistles and announced the arrival of the 100 km runners. If it were not for the lit headlamp of the 100 km runners to distinguish them as runners and eventually had the waiting event host alerted for his spiel, the sprinting runners might have crossed the finish line forgotten and without much fanfare. Among those who came in was a female acquaintance of mine who was running for about 26 hours. She mentioned to me later that two other runners I am familiar with were taking their time napping at the 70th kilometer. For her part she only had about half an hour sleep before pushing herself to proceed and finish the race. Finally, we at the 22 km were sent off. From the starting arch we ran uphill along Ordonio Drive then downhill toward Sheridan and into a rough road passing by a golf course that led to the Baguio Country Club 2nd gate exiting to Country Club Road. I often passed by this road coming from my hotel going to the Ayala Techno Hub where Camp John Hay’s main gate is located. It was nearer to the event’s venue. We then got off the road and ran uphill to Paterno. Altitude was wrecking havoc to my stamina. My heart was pounding more. My pace was slowing down. My camel back pack filled with 1.5 liters of water, jacket, Gatorade, and other stuff was weighing me down. Moreover the chest strap of the bag was a bit tight and squeezing my chest making breathing difficult. This was just about a couple of kilometers away from the starting lane. I began to imagine how the rest of the run might be bugged with trouble. From Paterno we took the South Drive. I walked along this road a couple of times since I came to Baguio on Friday. The first time when I got lost going back to my hotel. We then turned towards Loakan Road that led us to CJH Eco-Trail. My first impression of the trail was that it was far different from my previous trail run because all around me this time were pine trees and the ground were strewn with pine needles, some exposed tree roots and rocks. The ground was moist but not much slippery as in some of the wet and muddied trail I ran before. There were also wooden bridges and downward slopes. But basically the route was manageable. We met the runners from the 11 km category who were coming from the opposite direction we were going. We then exited at Ordonio Drive again near the starting area and crossed the road into another trail road passing by Le Monet Hotel. We were heading into the Yellow Trail. Occasionally we were coming across some of the straggling 100 km runners who were still finishing their run and still have a good 2 hours to go before their official cut of time comes up. We cheered them up to go on while at the same time envious of the feat they had so far then accomplished. 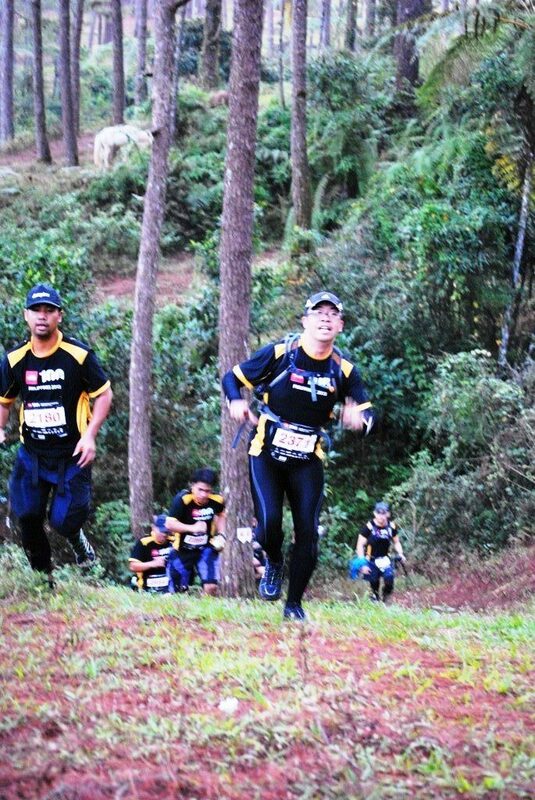 Smarting from the previous Nasugbu Trail run via Salomon I still have nightmare about that trail run but comparing what I was experiencing at TNF100 I would say I would prefer this run than the former. The route although had its shares of upward slopes, the slopes where rather shorter. The transitions to the slopes were gradual and not too steep. The tall trees where shady yet allows air to move about. Yellow Trail featured what being at 1500 meters above sea level was all about that is it has ravines dotted every path along the way. The danger of falling into one was a specter waiting to happen if one was not quite careful or alert at what one was stepping at. One most breathtaking route was the one just after an area where we passed by a zip line station. The trail after that had pine trees lining up like soldiers with sun streaking through the canopy above then it led into a precariously narrow trail with a ravine immediately gnawing at its the right side. We descended from this portion of the Yellow Trail and got off at Happy Hallow. I remember from my first Baguio 21k Run in 2012 there was a portion of this road that was so steep and almost laid waste on most of the runner who were not use to running uphill. It was a good thing that only a small portion of this road was taken in this race for we quickly were ushered back into the other portion of the Yellow Trail. We ascended again. As I was passing by the portion of the trail with a narrow path and a ravine on its side, I almost flung into the ravine. I got tripped again in one of the exposed root and it threw me almost over the edge of the path. I landed squarely on both my palms, which kind of prevented me from sliding further downward. At about the 15th kilometer of the race we reached a guard post that also doubled as the hydration station. From this point we were told to take a long zigzagging downhill route. We were literally hurling downwards. This route took us to what in the printed map simply identified as VoA. The next destination was the DENR Forestry which I couldn’t much picture in my mind what I saw so remarkable about this place except for the steepest up hill portion of this race may be found in this area. After this we were hitting the concrete of the main road until we entered Scout Barrio and the din of sound of the event’s venue were again blaring audibly telling us our approach to the finish line was at hand. Thereby inspiring us to push ourselves even though the route was still being covered with a lot of uphill path and now we were encountering tourists on horseback. We emerged at the familiar path were we could see already the sight of Le Monet Hotel beckoning us to rush towards it. I almost tripped again over a stump of tree in my haste. We were a huge clusters of runners when we came out of the trail and stepped into Ordonio Drive once again. We all began sprinting towards the finish line. Digging for the last ounce of strength we had to finish strongly amidst the cheering crowd and clicking of cameras by the photographers. I checked my watch for my finish time. It was about three hours and twenty-three minutes when I crossed the finish arch. I probably missed my chance to be photographed properly because I was busy trying to figure out how to stop my watch and save the information that I did not notice crossing the finish line. After I got y 100 Plus Isotonic Drink and a bottled water I walked out of the event venue. I already accepted the fact I won’t get any finisher medal souvenir of the run. The prospect of walking for another 15 to 20 minutes back to my hotel was my pressing concern. I met Ordonio Drive again but my feet took me only as far as Mile Hill were I took breakfast and later took a cab back to my hotel. Now I know why the female event host kept on using the phrase “back with vengeance”. It is because it leaves a bitter taste that if ever you did not finish the race you would want to go back and prove you can in fact finish it, it was just not your day that time. And for those who like us who ran half marathon the fact that you did not took any piece of physical evidence of your accomplishment makes you hungrier to go back, bite that bacon and bring it home. As I demolished my big breakfast I can almost taste next year’s run.